Good writers follow the rules. Great writers know the rules—and follow their instincts! Finding the right words, in the right order, matters—whether you’re a student embarking on an essay, a job applicant drafting your cover letter, an employee composing an email . . . even a (hopeful) lover writing a text. Do it wrong and you just might get an F, miss the interview, lose a client, or spoil your chance at a second date. Do it right, and the world is yours. For Leith, knowing not just the rules but also how and when to ignore them—developing an ear for what works best in context—is everything. 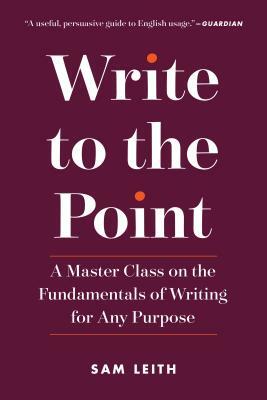 In this master class, Leith teaches us a skill of paramount importance in this smartphone age, when we all carry a keyboard in our pockets: to write clearly and persuasively for any purpose—to write to the point. Sam Leith is literary editor at the Spectator and columnist for the Financial Times, Evening Standard, and Prospect. He has published writing in the Guardian, Times, and Literary Supplement, among others, and is the author of many books, including his most recent, the critically acclaimed book Words Like Loaded Pistols: Rhetoric from Aristotle to Obama.